This is a somewhat silly but very fun read – inspired by a rather bizarre true a true story from India Desai takes that outline to very different places. 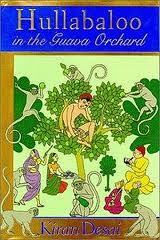 Nevertheless, the book is basically about a man who takes to living in a tree where he gains fame as a guru. Yes. Sampath Chawla has gone to live in a tree in order to escape the world. Everyone is concerned except his mother – but then, Mom is kind of weird herself. Sampath has had a rather different life already by the time he runs out of the house and into the tree. His mother ate a *LOT* during her pregnancy and became enormous and then Sampath is just as a huge monsoon strikes. It’s an ominous beginning. By the time he gets to the tree he’s failed just about everything his ambitious father has set out for him to do, school, a job at the post office. And now his father is angry because Sampath is shaming. Sister Pinky tries to protect him in her ways but she’s not too tickled by his activities either. Meanwhile, she wants to get on with life and meet a boy! Even the neighbors are concerned but more gossipy. What is to be done? Go to the wise man. The wise man tells Dad to get a bride for Sampath – so they get him a bride. That doesn’t work out very well so Dad has an inspiration that perhaps he can make some money off of Sampath. This works wonderfully well, everyone is happy – until the monkeys come. I suppose this could be considered a young adult book – age 14 and up or even younger. It’s still fun. This was Desai’s first novel and she went on to win numerous awards – Hullabaloo won the Betty Trask Award in 1998.